Inklings of Newark’s resurgence have been peppered throughout the press in recent years, and at YIMBY we have covered plans for a 22-story apartment building with 224 units set to rise at One Theatre Square, as well as Richard Meier’s “SOMA Plan,” which offers a blueprint for developer RBH Group’s transformation of the city. RBH’s current work in Newark is limited to smaller-scale projects like Teacher’s Village, though even that redevelopment is taking on a larger scope. And now it appears that the first tower within the larger master-plan may also be moving closer to reality. As the Wall Street Journal reported in late December, RBH is planning a mixed-use skyscraper with over 700 residential units, in addition to a hotel, retail, and office space. 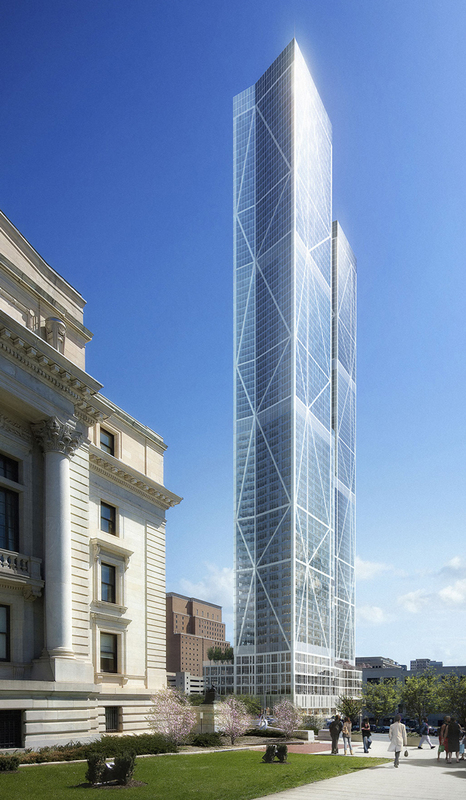 And YIMBY’s new look for the tower confirms it will certainly be distinctive, rising approximately 80 stories. While RBH has not released any formal height figures, the building appears to stand roughly 1,000 feet tall, which could (somewhat surprisingly) give Newark the distinction of having New Jersey’s first “supertall” of 1,000 feet or more. Jersey City’s boom has been immense, and its overall skyline has clearly surpassed Newark’s, but even its tallest proposal will stand 995 feet tall, falling short of the 1,000-foot mark. Jersey City’s resurgence has been obvious for the past two decades, but Newark’s revitalization has not been so swift. The lag in development has been a burden on the city until now, but urban redevelopment is finally pushing beyond the primary nodes outside Manhattan. And while Long Island and Westchester build at the same rate as Detroit, the same cannot be said for urban areas of New Jersey, where the next frontiers of Journal Square and Newark are just about ready for prime-time. 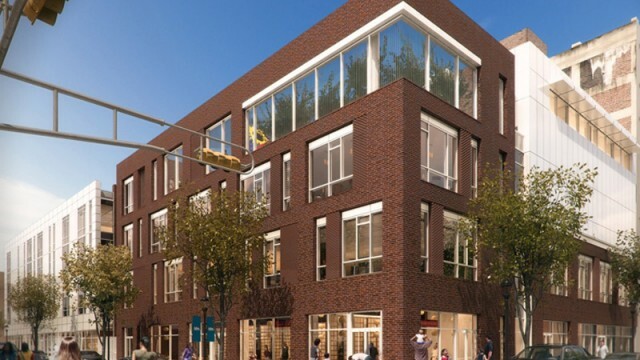 The Four Corners Millennium Project (“Millennium Project”) consists of seven mixed-use residential, hotel, office and retail buildings located in the heart of downtown Newark’s Four Corners Historic District. The exact layout is unclear, but the skyscraper will contain the bulk of the residences. The current breakdown of space is listed as 807,565 square feet of residential (split between 705 units), 70,815 square feet of hotel (130 rooms), 161,670 square feet of retail, and 110,000 square feet of office. While Newark’s safety record is frequently mentioned as a deterrent to new development, the city’s renaissance at the ground level is crucial to its future success, and it does seem to be starting. The expansion and success of Teacher’s Village shows that, even with present challenges, people will live and work in downtown Newark. The city’s central position in the regional transit network and its relative proximity to Manhattan will not be ignored forever, and the wave of money now reaching Journal Square is clearly making a bee-line for Newark, though it may take another ten years to truly arrive in force. But urban redevelopment awards pioneers greatly, and RBH’s success with Teacher’s Village is hopefully a bright sign for the Millennium Project, though no firm completion dates have been announced yet.